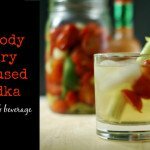 Bloody Mary Infused vodka is simply, vodka infused with peppers, tomatoes, celery, garlic and more for a low carb alternative to a Bloody Mary. Add your washed ingredients to a clean, dry quart mason jar. Fill to top with a middle shelf vodka. Screw on lid and store in the refrigerator for 1 week. To serve just add ice and garnishes such as celery stalks, lemon peels or grape tomatoes.